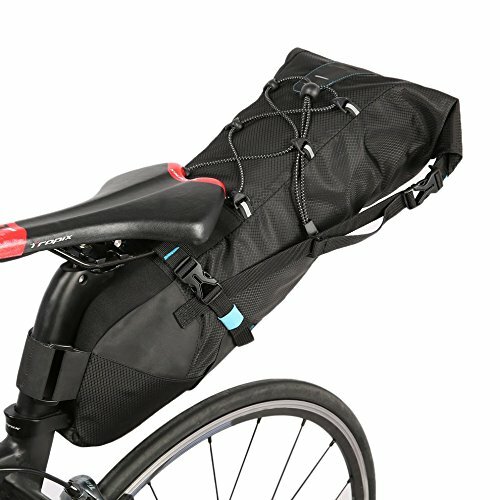 Search terms: Bike Bag, Large Capacity, Tail Rear Seat Bag, Waterproof, ROSWHEEL Features: EASY INSTALLATION & UNIVERSAL FIT: using one widen nylon tape attach to seat post and two solid SNAP-ON BUCKLES under bike saddle. Compatible with almost all kinds of bike saddle and seat post WATERPROOF: made of waterproof fabric and built-in all weather lining material in all hidden compartments, guarantee 100% waterproof. Under certain circumstances it can be used as a water bucket SAFETY ENHENCE: big REFLECTIVE PADS on both side and in front of bag, MULTIPLE POSTION taillight loops for better visibility in dark or reduced light Small rain proof polyester material, with waterproof zipper Fashion design and convenient to carry. Suitable for a variety of bicycles and outdoor cycling. Fixed by widen magic nylon tape with waterproof zipper side bag Description: Suits road bike, mtb for long distance bicycle trip Roll design,suitable for packing cell phones, money, key or ID card, etc. Cycling Bag with reflective LOGO, support board, and tail light(not include ) tape Specification: Material: Nylon&TPU Color: black Capacity: 3L-10L Size: 40*14.5*11.5cm Package included: 1 x Bicycle Saddle Tail Rear Seat Bag Note: Due to the difference between different monitors, the picture may not reflect the actual color of the item. Please allow slight deviation due to manual measurement. Thank you!